I feel like I've been a little disconnected from the blog lately and I didn't mean to neglect you-- we've just been so busy! Rest assured though that a busy life means I have tons of blog posts to write to keep you all up to date on what's been happening. I'm back and catching up now and wanted to share some photos from the biggest event from this past weekend: our friends Tara and Nick's wedding. It was a long fun night and one of the most beautiful weddings I have ever attended. What I loved most about it though was that Nick and Tara put a lot of thought into all of the details of their big day so that it was truly reflective of them. I know I am biased because they are friends, but I seriously feel like this wedding was Style Me Pretty worthy! I did my best to document a few of those details and wanted to share them with you here. Congratulations, Nick and Tara-- cheers to a wonderful couple and a beautiful evening! Didn't they look amazing? So classic and elegant. 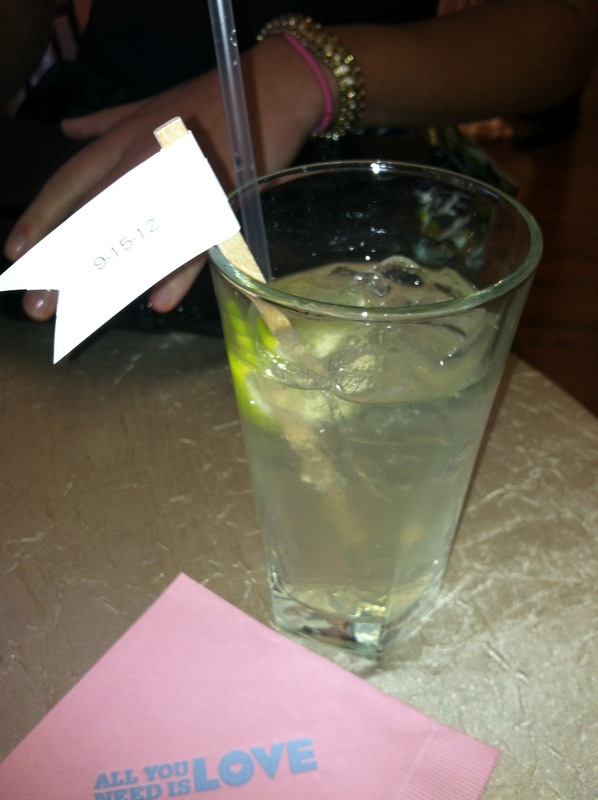 Even the food and drinks were totally personal. They served their favorite Moscow Mules at cocktail hour and since Tara's notoriously obsessed with mac and cheese, it was served as a dinner side. In general, they served a ton of food-- which I firmly believe is an excellent strategy for ensuring your guests enjoy themselves. From the mini tacos, burgers, and hot dogs at cocktail hour to the mini dessert spread to the late night pizza delivery, it felt like attending a formal version of one of the couple's annual (and always popular) Superbowl parties. Amazing! The reception hall looked amazing -- everything in romantic shades of ivory and pink, big full floral arrangements with roses and hydrangeas (my favorites! ), and lots of candlelight. Another great detail-- one of their favorite weekend activities is having coffee and Starbucks and doing the crossword in the newspaper. 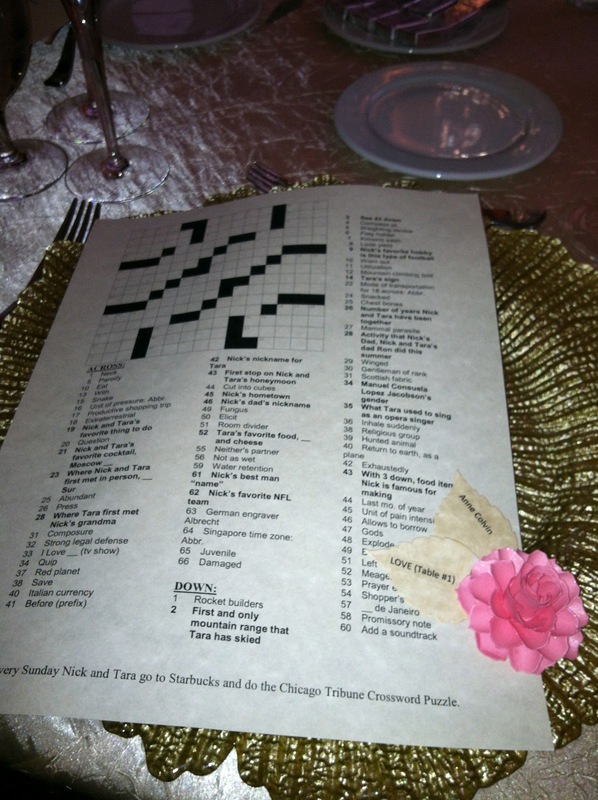 They created their own puzzle that incorporated details about them as a cute little guest activity. I think the photo booth is quite possibly the most brilliant new trend for wedding receptions. If I could go back and do one thing differently at our wedding I would have rented one of these. The photos are priceless! It was a really beautiful event, right? Also, have you heard about the WeddingParty iPhone app? I love social media and I think that this is a totally brilliant wedding tool. A few days before the wedding the guests received an email invitation to download their custom app. Once we did that, we were able to share messages and the photos that we have taken at the wedding and during the wedding weekend with the bride, groom, and other guests that have logged in via the app in real time. Pretty cool! 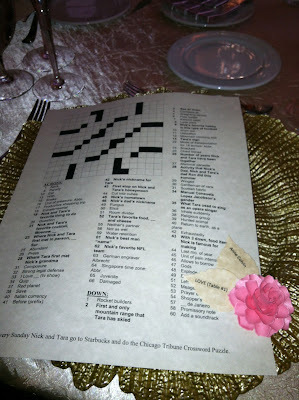 All the photos shared in the An Elegant Chicago Wedding were nice to see. Congrats to the couples for the wedding and the wonderful arrangements. Most of the engaged people are finding difficult to plan the wedding. They may use the wedding app to ease the wedding tension. Thanks for the suggestion! I think these wedding apps for smartphones are totally genius.